David Miliband & Ed Davey have challenged William Hague on Tory EU policy, arguing that a Conservative government would lessen British influence in the world. 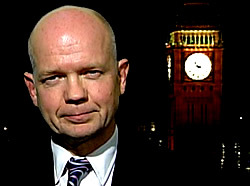 Last week foreign secretary David Miliband and Liberal Democrat foreign affairs spokesman Ed Davey challenged William Hague on Conservative EU policy, arguing that a Conservative government would lessen British influence in the world. The discussion was held as part of a major Chatham House project, ‘Rethinking the UK’s International Ambitions and Choices’. Speaking on David Cameron and his shadow foreign secretary’s decision to take Conservative MEPs out of the mainstream centre-right grouping in the European Parliament, the three clashed on Hague’s contention that it is fanciful to suggest that you cannot work with other nations in Europe “as long as you set out in the right way and have the right agenda”, and that “the niceties of European political parties and alliances are a minor consideration by comparison”. Furthermore, Miliband recalled that European foreign ministers at the monthly Foreign Affairs Council meetings have told him that they see the Conservative move as a “symbol” of how “profoundly wrong” Hague “sees British influence being exercised, not just in Europe, but around the world”. Indeed, as Davey insisted, Conservative policy would weaken British influence worldwide. Nor, Davey reminded us, is Conservative policy welcome in the US. In fact the Obama administration has consistently encouraged the Conservatives in the direction of Europe, finding it strangely out of tune with the President’s rectification of the unilateralism of the Bush years. OK………. so he looked like a twerp with the banana, but personally I didn’t loose total respect for him until February 10th this year…..
Dammit, Labour and the Libs need to unite to fight the Tories!